The Old Foodie: On gods, mice, and leaves. The Temple of Apollo on the Palatine Hill in Rome was dedicated on this day in 28 B.C.E. Apollo was the god of music, poetry, light, healing, truth and prophesy. He was also the god of justice, order, and reason – although it appears that he did make unreasonable requests of the beautiful river nymph Daphne, who had sworn a vow of virginity. Daphne, so the story goes, was fleeing his advances and appealed to her father, the river god Peneus to save her, whereupon he changed her into a laurel tree. Apollo, grief-stricken (and chastened?) swore always to wear a laurel wreath on his brow in remembrance of her. Apollo was also a god in the Greek firmament, and laurel leaves - which we usually now call Bay leaves - were used in rituals at Apollo’s temple in Delphi, perhaps because sufficient bay oil is mildly narcotic. On the Aegean island of Tenedos however, Apollo was associated with mice – although the reasons are obscure – and priests certainly used mice in rituals there, perhaps even eating them. So, today’s theme being bay leaves and mice in ancient Rome, what do we do for recipes? The Romans were known to enjoy a dormouse or two, and there are recipes to prove it, but dormice are not, technically speaking, mice. They are both rodents, but the scientists have placed them in different families, which matters not a whit to us, as substitution of ingredients is a time-honoured technique in cookery. The edible dormouse (Glis glis) gets its common name from its habit of sleeping up to three-quarters of its life (dormir = to sleep), and its scientific name refers to its luscious fat (gliscere = to grow). The Romans reared them for the table in pens called gliraria, supposedly feeding them on hazelnuts which must have improved the flavour no end. If, perchance, you are unable to procure dormice for today’s recipe, you could substitute another rodent such as squirrel, beaver, guinea-pig or nutria for example. The green sauce with bay leaves, “for fowl”, would surely go well with the dormouse flesh? Pepper, Caraway, Indian Spikenard, Cumin, Bay Leaves, all kinds of green herbs, Dates, Honey, Vinegar, Wine, Little Broth, and oil. Is stuffed with a forcemeat of pork and small pieces of dormouse meat trimmings, all pounded with pepper, nuts, laser, broth. 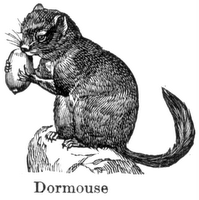 Put the dormouse thus stuffed in an earthen casserole, roast it in the oven or boil it in the stockpot. perhpaps i might partake in a dinner of cuy to commemorate this special day.